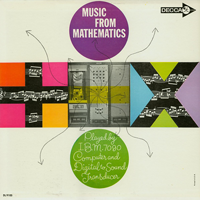 Music from Mathematics is one of the first computer music collection, published two years later a first edition, very different in respect to this. It’s a long playing edition, edited by DECCA Records, that gather most of the early experiments realized at Bell Labs through Music N programming languages; developed by Max Mathews and his staff (among these John Pierce and Newman Guttman). The first aspect that we needs to underline refers to aesthetic issues. In fact, this record, contains tracks that were born as experimental activities, useful for investigating computer features or musical matter. The only musical work that has interesting aesthetic qualities, although named study, is Noise Study, about which we have already written for the James Tenney’s album review: Selected Works 1961-1969. Interesting are even the David Lewin’s experiments. He’s remembered primarily as music theorist that studied Composition with Roger Sessions and Theory with Milton Babbit. Grove, the authoritative musical encyclopedia, mentions Lewins as the first professional composer that composed music with computer; although this primacy, reading the literature on computer music, seems to belong to James Tenney. One thing is certain: to listening Noise Study is characterized by an approach much closer to the potentiality of the new technological instrument, thing that render this track more interesting of Lewin’s studies that, indeed, are characterized by a contemporary style but seem a imitation of music composed with traditional instruments, furthermore with a questionable timbre result. Apart from the works before cited, this collection puts together tracks that we remember as finds of a technological prehistory, stimulating curiosity rather than admiration. John Pierce’s works, for example, are always designed to demonstrate some computer feature such as its capability to processing new timbre solution (is the case of Stochatta, Beat Canon, Variations in Timbre and Attack and Molto Amoroso) or to obtain complex rhythmic solutions (Melodie, Five Against Seven). Same considerations we can do for tracks by Max Mathews, with music focused on rhythmic issues (May Carol) or timbre problems (Joy to the World, The Second Law and Numerology – this last is structured in eight sections, each dedicated to a single matter). Another case is that of Bicycle Built for Two (also called Daisy Bell), a song that was realized to show computer capability for speech processing. There is another reason for which this song is very popular: it aroused the interest of the film-maker Stanley Kubrick, which adopted this melody in his 2001: A Space Odyssey. Briefly we recall that according to the initial intention, the British film-maker wanted to use the sound materials synthesized by Max Mathews, but finally he preferred to use a real human voice, due to the poor text intelligibility in the computerized song. Complete the collection: Frère Jacques (a French traditional melody, synthesized by computer), Fantasia by Orlando Gibbons (sixteenth century composition), Theme and Variations (a study of the psychologist David Speeth) and finally Pitch Variations by Newman Guttman, realized after The Silver Scale, the first music piece synthesized through the computer, of which we talked for Music I. About Pitch Variations, furthermore, it is interesting to mention two historical events: this is the first music piece executed publicly, in 1959 during a electronic music concert in New York, was presented by composer Edgard Varèse. Then, in 1962, it was performed in Gravesano, Switzerland, at experimental studio by Herman Scherchen, with the presence, among all, of composer Iannis Xenakis. One last consideration. The LP cover was drawn by Alex Steinweiss (died recently, July 2011), a graphic designer famous for introducing custom graphics for LP cover instead of the anonymous brown packs. About this cover, we appreciate the graphic design that plays with mathematical symbols: addition. subtraction, multiplication, division. Inside the latter, he added title and subtitle.